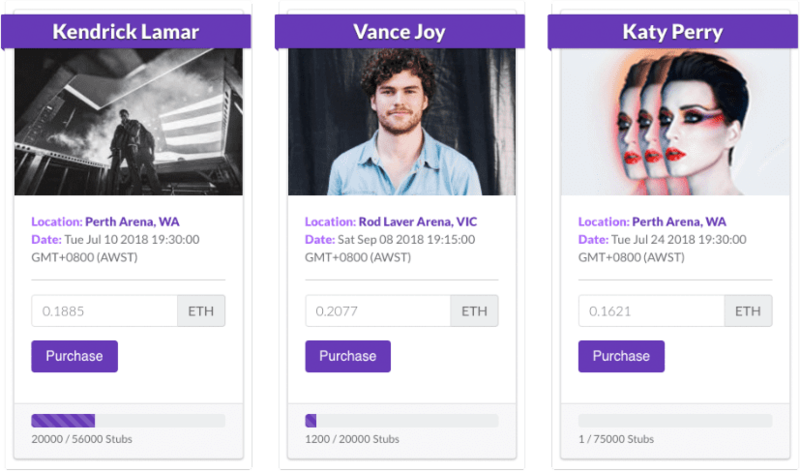 Digitally traceable ticket sales on the blockchain. 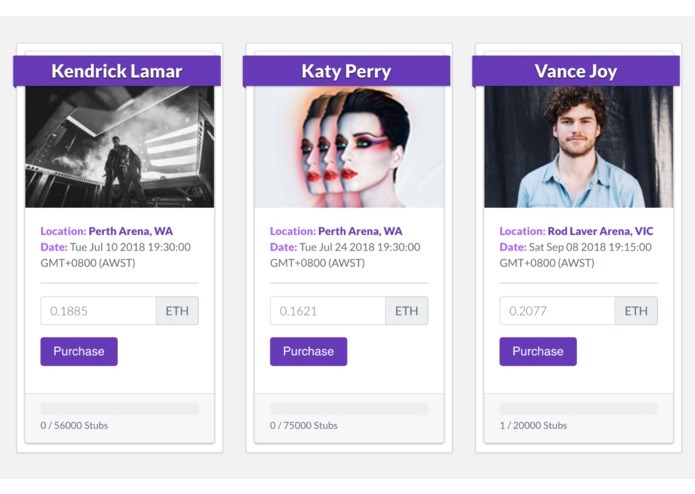 The problem I decided to tackle with Stubber was to deter ticket scalping for concerts by providing a platform that manages the sales of storage for various events on the Ethereum blockchain. On top of these public facing details, information about how many tickets have been sold, and most importantly it is able to limit the changing of hands of a ticket for a higher price then what was paid upfront. While it's clear that it doesn't completely block scalpers from charging for tickets at a higher price through an external transaction, it does at-least bring to light the difference in price between what a scalper paid for the ticket they are trying to sell a loyal fan; and hopefully this in itself is enough to deter most, if not all of the shady sales. ownership/Ownable.sol - Handled the contracts Ownership to the address that deploys the contract. 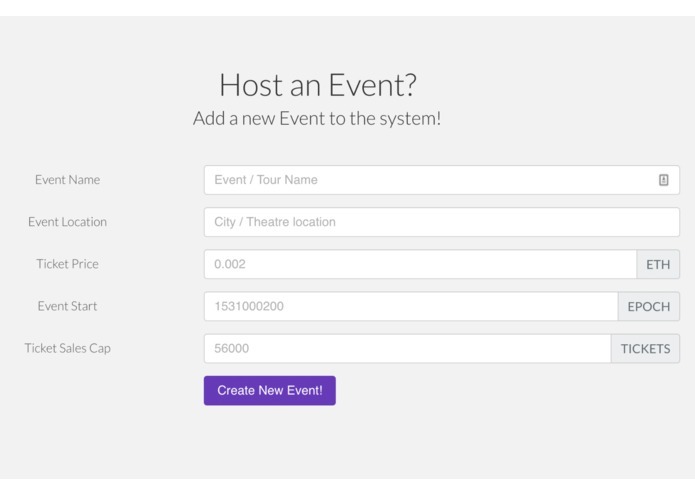 This allowed me to lockdown the createEvent function and a couple other sensitive functions. 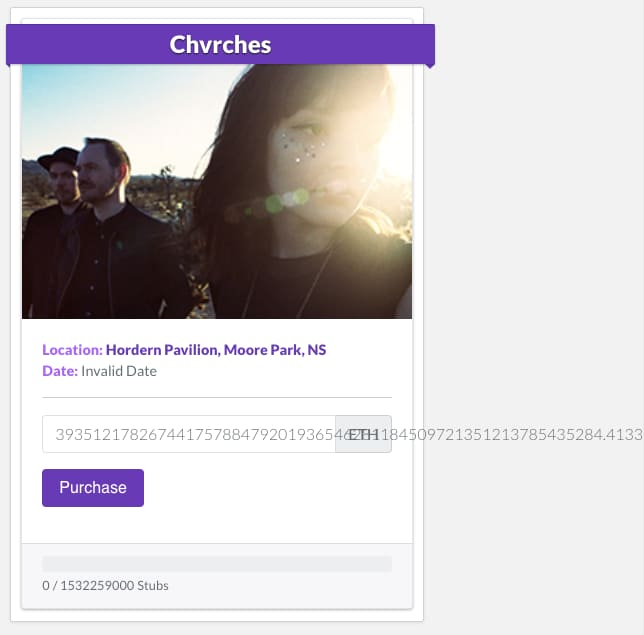 token/ERC721/ERC721Token.sol - The Tickets are ERC721 compliant tokens, and I made sure of this by using the Open Zeppelin standards for this. A good majority of my problems were around poor data sanitisation from the front end application; I wasn't handling conversions between data types like byte32 -> uint correctly and ended up with some pretty interesting results! It was really interesting to work with a contract that had two core Struct types within it. In the past most of my contract work has been built around 1 single struct that is more often then not simple a container for the data in the ERC721 tokens. This time around it was fun to have to work in the Event Struct. I'm also really proud to have worked a bit more on the frontend stuff, It's certainly not my strong suit but I'm definitely getting a lot better. Come up with a better solution for storing the image URL / image data for the event picture. 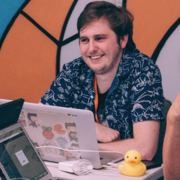 I'd really like to explore IPFS a bit more and look into how I could possibly deploy an image to IPFS and then store the URL to that image in the contract. Move the UI across to React / Angular; I've never really worked with these frameworks, however I noticed that Truffle has a UI frameworks now called Drizzle I'm keen to learn. I worked on this project solo; designed and wrote the smart contract(s) and fontend application.